The IPSC has been invited to take part in the march and pagent organised by the ‘Reclaim the Vision of 1916′, a non-party political citizens’ initiative to honour the women and men of 1916 who fought for their freedom 100 years ago just as Palestinians continue to fight for theirs today. We ask you and your friends and family to join the Palestine Bloc in the march. 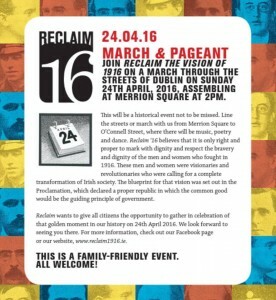 We will be assembling at Merrion Square in Dublin, at 2pm on Sunday 24th April. Look out for the Palestinian flags and come join us. This is a family friendly event! All welcome – – especially members of the Palestinian community in this country. This will be a historical event not to be missed. Line the streets or march with us from Merrion Square to O’Connell Street, where there will be music, poetry and dance. Reclaim ‘16 believes that it is only right and proper to mark with dignity and respect the bravery and dignity of the men and women who fought in 1916. These men and women were visionaries and revolutionaries who were calling for a complete transformation of Irish society. The blueprint for that vision was set out in the Proclamation, which declared a proper republic in which the common good would be the guiding principle of government.